The battle between kids and vegetables is frustrating for parents. 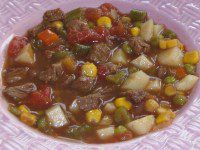 But this vegetable beef soup recipe is so delicious, even the pickiest eaters will gobble it up. The best part about this recipe is that it's easy to tweak to your children's own preferences. If they love corn more than green beans, add more corn to the recipe. You can't mess up this recipe. It only gets better the more you customize it with your family's favorite flavors. So brace yourself. This recipe will have the kids saying, "More veggies, please!" Brown stew meat in a non-stick skillet. Cut into small pieces. In a large soup pot, add all ingredients. Heat to boiling. Reduce heat to low. Cover for about 20 minutes or until vegetables are nice and tender. If you have leftovers, the vegetables will soak up the beef broth. Add a splash of water to serve soup again or use the leftovers as-is for a tasty side dish with your main meal.